Jack ‘n Jill Magic Junior continues to bring surprising possibilities to anyone, anywhere. For hundreds of grade school kids at selected elementary schools, a Nothing Like Magic moment happened when they received a surprising break from school lessons through a demonstration and basic tutorial of Arnis, the country’s national sport. The Magic Junior Arnis Clinic visited ten (10) schools around Metro Manila to promote not just proper exercise but also the importance of eating right. The program also promoted the value of discipline through an Arnis demonstration and tutorial from Kali Arnis Martial Arts Organization. More than 500 students from the Colegio De San Juan de Letran, St. Scholastica's Academy, Lourdes School of Quezon City, St. Ignatius of Loyola School, Doña Aurora Elementary School, PCU-Union Science Elementary School, Adamson University, FEU-FERN College, Makati Elementary School and Philippine Women's University – JASMS took part in the Magic Junior Arnis Clinic. 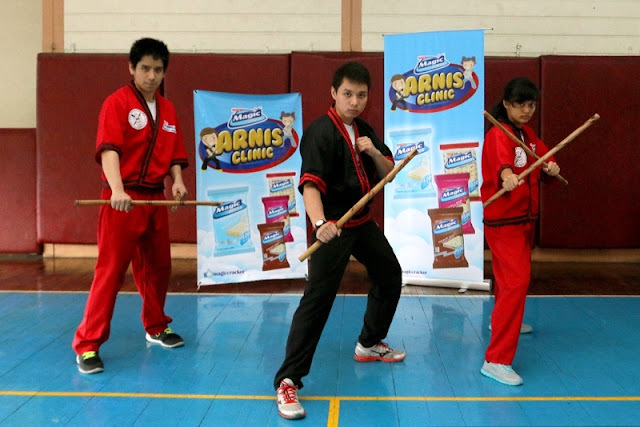 Aside from the Arnis training, the kids were also treated to Magic Flakes Junior Crackers, Magic Creams Junior Butter & Berry, Magic Creams Junior Chocolate, and Magic Creams Junior Condensada during the event.